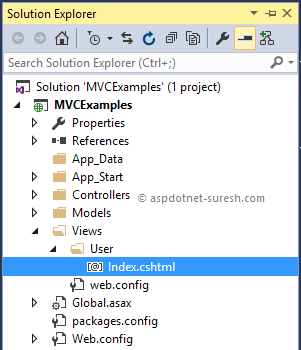 Here I will explain how to bind dropdownlist from database in asp.net mvc with example or asp.net mvc populate dropdownlist from database with example or asp.net mvc fill dropdownlist values from database with example or asp.net mvc bind dropdownlist from database and get dropdownlist selected with example. 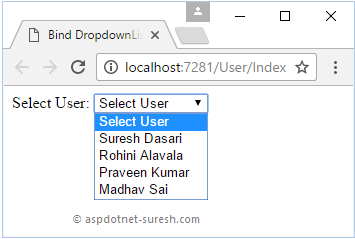 In asp.net mvc by using @Html.Dropdownlist or @Html.DropdownlistFor properties we can easily implement dropdownlist based on the values from database. 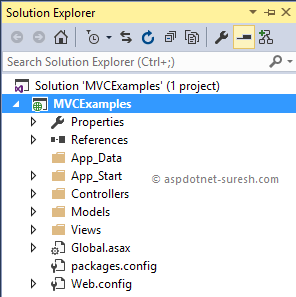 In previous articles I explained asp.net mvc tutorial with examples, asp.net mvc action verbs with example, html helpers in asp.net mvc with examples, asp.net mvc redirect to another view or controller action method, asp.net mvc show alert message after post data, asp.net mvc insert data into database with example, asp.net mvc tightly coupled view in application with example, and many articles relating to asp.net mvc, asp.net, c#,vb.net. 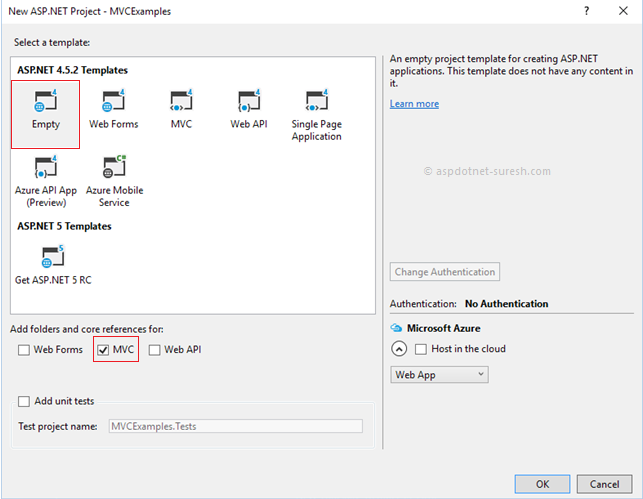 Now I will explain how to bind or populate dropdownlist from database in asp.net mvc with example. 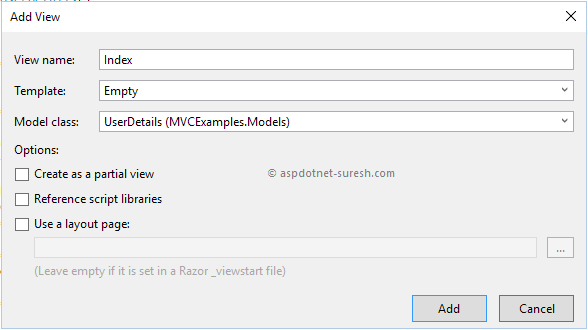 In asp.net mvc we can implement dropdownlist by using two properties either @Html.DropDownList model or @Html.DropDownListFor model. Before we start implementing first design userdetails table in database and insert some data like as shown below. 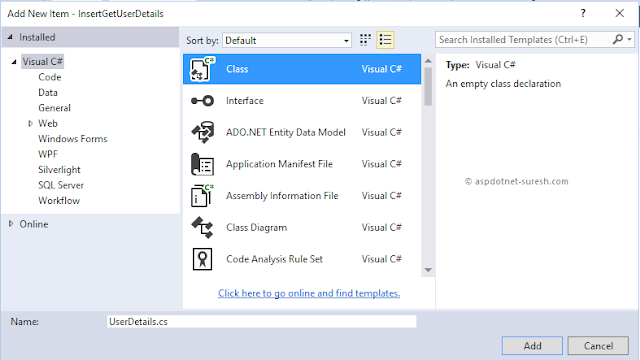 Or use following query to create userdetails table in database and insert some data to bind values to dropdownlist. Once we click on Class new popup will open in that give name of your model as “UserDetails” and click Add button like as shown below. If you observe above controller code, we are getting user details from database. 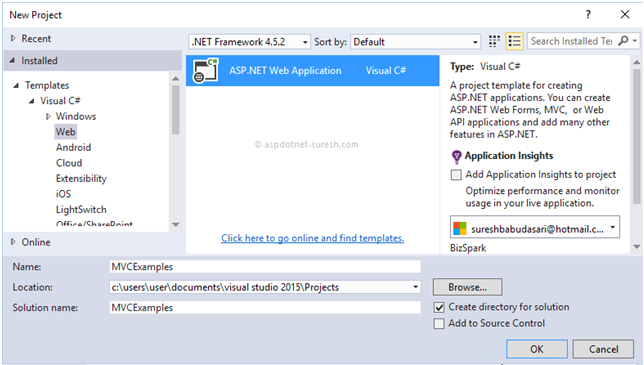 This is how we can bind dropdownlist in our asp.net mvc applications based on requirement. Hi Suresh,It is a useful article.If i need to bind more than one dropdown list in one page from database what should i do.please suggest.